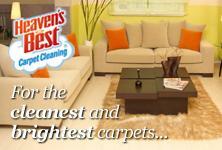 Heaven’s Carpet & Upholstery Cleaning is the Premier Carpet Cleaner in Mountain Brook AL. Heaven’s Best was started in 1983 by Cody Howard of Rexburg, Idaho. Since then, Heaven’s Best has grown into an International Carpet Cleaning company with locations throughout the United States, Canada and England. The reason Heaven’s Best was started is because there was a need for a different type of carpet cleaning that did not requires hours or even days for the carpets to dry. Unlike other carpet cleaning processes that soak your carpets and then take a very long time to dry, Heaven’s Best uses a low-moisture process that will thoroughly clean your carpet but only takes about 1 Hour to Dry. This means that our carpet cleaning process is less disruptive to your life. We want our customers to have clean, fresh carpets and to get back to their normal life and activities in no time. At Heaven’s Best Carpet Cleaning, our main objectives are to thoroughly clean your carpets and to make carpet cleaning at your home an easy and stress-free process. Our technicians are professionally trained to treat you and your home with the honor and respect you deserve. The owner of Heaven’s Best Carpet Cleaning of Birmingham, Stephen Mobley, spent 18 years in the US Marine Corps where he developed his core values of honesty, integrity, dependability and pride. While in the military, Steve learned how to clean or "field day" almost any area to precise standards. Stephen is extremely detailed about cleaning and that’s how he trains his employees to approach every cleaning job. Heaven's Best Carpet Cleaning has been awarded top Franchise winner in the "Cleaning and Maintenance" category by Franchise Business Review for 7 years in a row. Besides receiving an overall excellent rating, they scored 4.8 out of 5.0 on Core Values. Core Values is what Steve stands for and it is how he runs his business. If you are looking for the Premier Carpet Cleaner in Mountain Brook AL, call Heaven’s Best Carpet & Upholstery Cleaning at (205) 618-9150 today. We offer FREE ESTIMATES and excellent customer service. Contact us Today to schedule a Carpet Cleaning!